BOSTON - The Boston University women's ice hockey team suffered a 5-0 setback against No. 9 Northeastern in Friday night's home opener at Walter Brown Arena. - It was an evenly matched opening 20 minutes, with BU (0-1-0, 0-1-0 WHEA) outshooting the Huskies, 8-7. - Northeastern (1-0-0, 1-0-0 WHEA) capitalized on both power-play chances it had in the first period, opening the scoring at the 9:33 mark before another goal at 19:42 made it 2-0 after 20 minutes. - Chloe Aurard extended the lead to 3-0 with a shorthanded tally at 8:33 of the second stanza. - Northeastern added a fourth goal late in the middle frame before Skylar Fontaine completed the scoring at 8:38 of the third period. - The Terriers nearly got on the board in the final minute, but a quick whistle denied what would have been sophomore Jesse Compher's first goal of the season. - Sophomore Corinne Schroeder made 28 saves. - Senior captain Reagan Rust led the Terriers with five of the team's 14 blocked shots. - Rust and redshirt junior captain Sammy Davis each had a team-high five shots on goal. - For Davis, this was her first time in the Terrier lineup since the 2017 Hockey East semifinals. She missed all of last season due to injury. 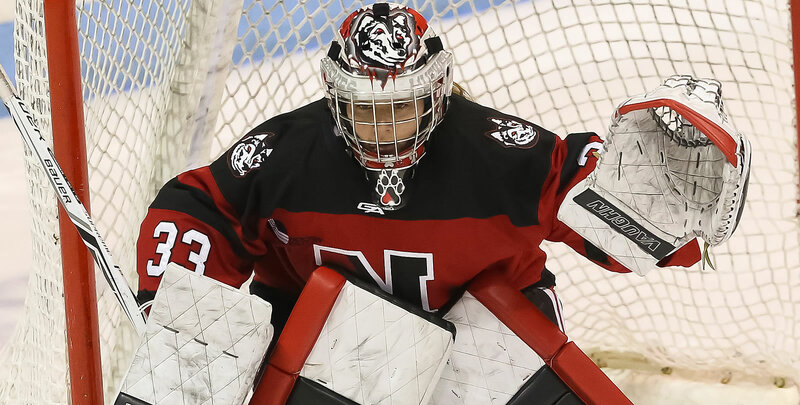 - Northeastern's Aerin Frankel made 28 saves. - This was the first time the Terriers have been shut out since the 2016 Hockey East title game. - Friday marked the first time an opponent held BU scoreless in a regular-season game since Feb. 19, 2015. - The Terriers were the only team to score a goal in every game they played last season. - The Terriers will look to even the season series with the Huskies on Saturday at Walter Brown Arena. - Puck drop is scheduled for 3 p.m.